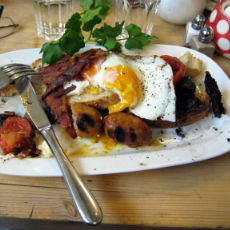 Whether you’re nursing your head after a big night out or just don’t fancy cooking at the Weekend be sure to check out our popular list of the best places for breakfast in Brighton and Hove. We’ve recently updated the list so it is always current and our top favourites still remain so if you haven’t already tried them then we suggest working your way through the list to experience all the delicious dishes. If you have tried them already then we’re sure you’ll be going back for more soon! Want more weekend foodie inspiration? Check out our guide to Brighton’s best roasts! 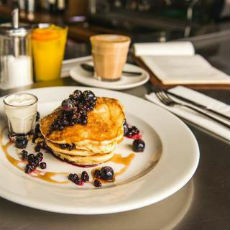 Bills has been praised for its award-winning breakfasts through to delicious and unusual brunch and lunches. You can expect a warm welcome and freshly prepared and wholesome dishes. The popular breakfast menu includes dishes such as the famous fried breakfast in regular or veggie, a poached egg and salmon bagel or a stack of home-made blueberry and buttermilk pancakes for those with a sweet tooth. Kensingtons in a very special little cafe in the North Laine. Whether you’re looking for a gut busting breakfast, some tasty home made chilli, a bowl of cheesy chips or just a cup of tea, Kensingtons is the place to be. With a vast array of delicious food, a spacious balcony and a friendly and warm service. Kensingtons offers a range of options for breakfast; full fried meat and veggie breakfast, eggs on toast and delicious hot drinks. Plus, you can also swap the items you don’t want for those you love, great for fussy eaters. The best and freshest breakfast hashes in town. Billies is a tiny little cafe tucked away off of the busy Western Road and it deserves a shot. The portions are generous, the quality is undeniable, and the service is excellent. 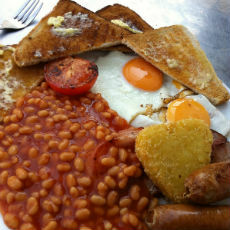 The menu ranges from their Famous Hash Browns to Billie’s All Day Jumbo Meat Breakfast both with veggie options. 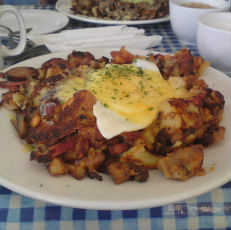 Try their speciality; the Farmhouse Hash: Sausage, bacon, baked beans & mushrooms pan-fried in butter with home-made hash browns and topped with a fried egg & grilled cheese all for 8.10. The New Club in Brighton is a super-cool american style eatery. It uses quality ingredients to brings you an LA style Indie Coffee House, mixed with the vibes of a New York Bar and Diner. The New Club boasts a mouth watering range of inventive breakfasts, hang over cures and ‘hard’ brunch beverages. You’ll get your full fry up for £9 but the stack of buttermilk pancakes with optional blueberries/ Greek yoghurt/ maple syrup bacon is also worth a go. If your feeling up to it the hard brunch beverages include the Chorizo Bloody Mary – House infused Chorizo vodka, house smokey spice mix, lemon juice, tomato juice, port & steak sauce with cucumber & chilli pickle served tall over ice. This Brighton chain has branches on Ship Street, Queens Road and Brighton train station. Breakfast is available daily with a menu that has something for everyone ranging from a pancake tower with pasture raised bacon & male syrup to Eggs Benedict with Parma ham, local free range poached eggs and a chive hollandaise sauce. Go for the amazing pastry selection. 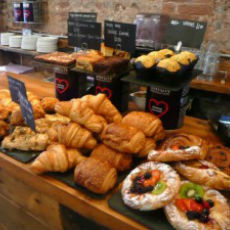 Praised for it’s perfectly rich coffee and its heavenly and flavoursome pastries. Where possible all of the ingredients and suppliers are free range and local. Infinity foods cafe is an organic, vegetarian and vegan haven based on Gardner Street. They serve natural, locally sourced and organic vegetarian food inspired by seasonal variety and infused with a diversity of cultural and culinary traditions. Everything is vegetarian and most is suitable for vegans too. 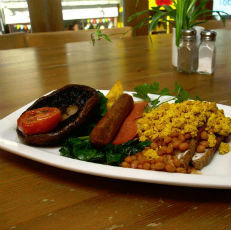 Breakfasts include the full veggie or vegan works for £8.50. Alternatively try the Mediterranean Medley (slow roasted vine tomatoes and a poached egg on toasted sour-dough with roasted red pepper hummus and balsamic drizzled rocket). The Portobello & Polenta Scramble features roasted portobello mushroom topped with scrambled eggs or scrambled tofu, served on a bed of pan fried spinach with roasted oregano polenta slice & sweet chilli sauce. 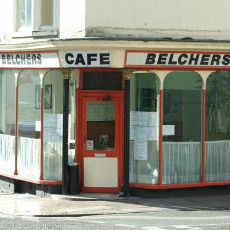 Speaking of hangovers – Belchers is providing the Brighton’s best Cholesterol slathered feasts from early till late and attracting the hungover masses all year round. An unapologetically greasy British classic! Perfect when you fancy a decent plate of grub and a builder’s tea.Right off the Western Road, the exterior is appropriately shabby which somehow makes it all the more appealing. Sometimes a builders caf is all that will do. With branches on Western road and Kensington gardens, Iydea has been widely and highly praised for it’s delicious food. It has won the best cafe in Brighton and Hove foodie awards in 2013 and the Vegetarian Society’s National Best Eating Out Award. It does a great meat and veggie selection, selling good value and top quality food and offering a large selection of freshly prepared hot and cold meals from natural raw ingredients served in the greenest possible way. Idyea boast an comprehensive breakfast and brunch menu. 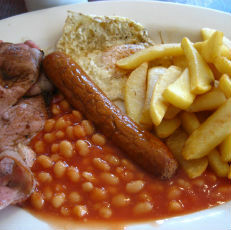 The big breakfast is £6.95 or you could go small for £4.25. 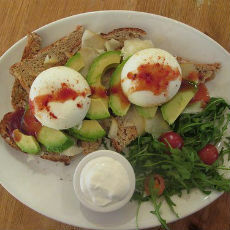 Have your eggs poached with avocado and smoked Cheddar, sweet chilli source and soured cream. 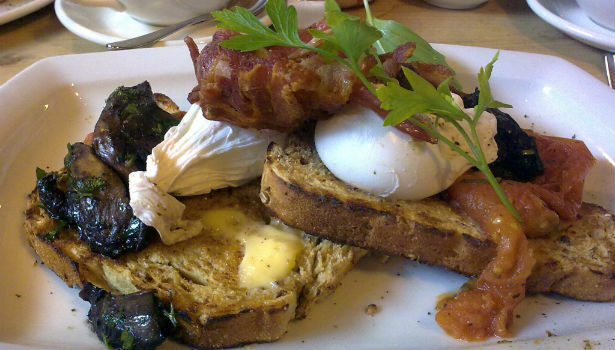 Or perhaps go for the Babylon style – poached with baby spinach, feta and mint on buttered muffin. Also try the banana nut toast and the brunch muffin: an avocado, sausage and hummus based toasted muffin. Nestled amongst the record shops, boutiques and trendy pubs of St James’s Street sits the inviting yellow doorway of Little Miss Piggies, a pork-lovers paradise! 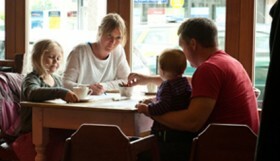 The independent, family-run cafe has a friendly, local atmosphere and serves up traditional British breakfasts, lunches and snacks seven days a week. If you’re looking for a cute breakfast spot, they have it all: from wholesome porridge and guilt-free granola, to a classic fry-up that promises to cure any hangover! 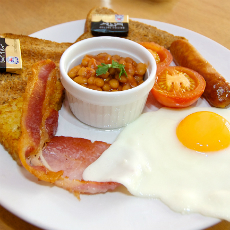 If you’re looking for proper English fare then this is the place and their English Breakfast is just £3.95! Read more about them here. Looking for lunch? 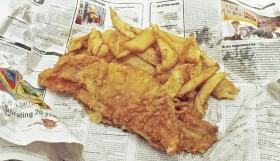 Why not check out our Fish and Chips guide here! Family Friendly Places to Eat and Relax!